One of our most important resources is at risk: SEEDS. One of the world's most precious resources is at risk. This timely and emotionally moving film illuminates what is at stake and what can be done to protect the source of nearly all of our food: SEEDS. Seeds provide the basis for everything from fabric, to food to fuels. Seeds are as essential to life as the air we breathe or water we drink...but given far less attention. Over the past one hundred years seeds have shifted from being common heritage to sovereign property. 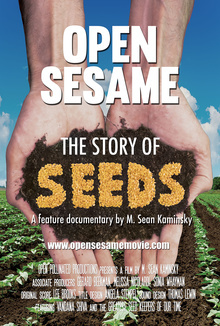 This film tells the story of seeds by following the challenges and triumphs of some of their most tireless stewards and advocates. "This film is a seed in its own right and can play a seminal role in planting ideas that bring together food security, food sovereignty, human rights and the consumer right to know -- exactly the "big tent" we need to win this issue." "A passionate labor of love about seeds.."